As the world's most powerful media magnate said when he happily spoofed himself on The Simpsons a few years ago - "I'm Rupert Murdoch, the billionaire tyrant". For those who hold that description to be true, the news that Mr Murdoch wishes to regain full control of UK satellite broadcaster BSkyB will fill them with dread. Currently holding a stake of 39.1%, Mr Murdoch's News Corporation has so far offered 700 pence a share, which values BSkyB at around £12bn. BSkyB has rejected that offer, but committed to talks in the hope of doing a deal above 800p a share. With most commentators saying it is all but inevitable that the two firms will ultimately agree a price, it is not clear that the deal will be given regulatory approval. But if it does, what would it mean for the UK's media industry and for the people of the UK? Which in turn raises the question, why does Mr Murdoch want BSkyB back? In the first instance, News Corporation has a lot of money to spend, according to Tabitha Elwes, partner at media consultancy Value Partners. "News Corp is very cash rich, and BSkyB is seen as a family asset," she says. "So it is perhaps understandable that in these circumstances it wants to take full control." This view is shared by analysts at brokerage Numis Securities, who say that News Corporation is sitting on a cash pile of $8bn (£5.4bn) "on which it is earning little return". But even with cash to burn, Mr Murdoch is not going to buy BSkyB for the sake of it. Instead, Tim Luckhurst, professor of journalism at the University of Kent, points to a number of strategic factors which explain why his ambitions make sense. "If I was Rupert Murdoch I'd be looking at the huge losses being made by some of his newspapers, and the big profits made by his TV assets," says Professor Luckhurst. News Corporation owns the Times, the Sun and News of the World in addition to its stake in BSkyB. While the most recent figures show that BSkyB made a pre-tax profit of £707m in the nine months to March, up from £339m a year earlier, Professor Luckhurst says the Times newspaper is losing in the region of £240,000 a day. "The Sun remains very profitable, but the Times is struggling, like most broadsheet papers," he says. 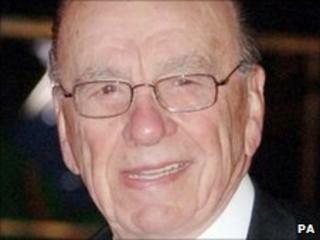 "Many people knock Rupert Murdoch, but he has subsidised the Times - the grand old lady of Fleet Street - for many years. "So if the newspaper side of the group is struggling, which is a prominent industry-wide trend around the world, it makes business sense to increase the TV side of the operation." Ms Elwes also points to News Corporation's imminent move to start charging on its newspaper websites. Readers of both the Times and the Sunday Times will have to pay to access them online from the end of this month. And two of its other publications, the Sun and the News of the World, could soon follow suit in charging for online content. Ms Elwes says that if and when News Corporation fully owns BSkyB it could boost the Sun and the Times' online readership figures by bundling access to the two papers' websites in with Sky's broadband packages. "Bundling the Times and the Sun's online operations into BSkyB, would create synergies, and give all three much greater flexibility to be creative," she says. "The jury is still out on whether News Corporation putting up pay walls on its newspaper websites will be successful, but they would certainly be helped by BSkyB being on board." But seeing as the proposed deal would remove any doubt of Mr Murdoch's dominance of the UK media sector - creating a giant that dwarfs even the licence-fee funded BBC - what chance does it have of getting regulatory approval? There will certainly be a wave of protests from other newspaper groups and broadcasters who will be concerned that News Corporation will have even more dominance and ability to gain advertising revenue. Such concerns would be particularly appropriate at a time when the future of broadcasting is widely seen as a part of a multi-media world where owning both TV stations and online newspapers may prove to be the ideal. In the first instance, the European Commission would look at whether the planned merger could go ahead, or whether it should be blocked on anti-competition grounds. However, it is likely that the matter would be called back to the UK, either by the Office of Fair Trading (OFT) or by Business Secretary Vince Cable. The OFT could call it in on anti-competition fears, while Mr Cable would have to announce public interest grounds for an investigation. If Mr Cable was to do this, he could then ask both the OFT and media regulator Ofcom to investigate, but he would be making the final decision himself. Whoever was to end up deciding on the acquisition, analysts agree that it is unknown whether it would be approved. "I don't think any analysts genuinely know whether any deal would be cleared," says Steve Lietchti of Investec Securities. "However, the regulatory process would certainly delay any takeover." Professor Luckhurst says it will be a very difficult regulatory decision to make. "There is no doubt that in the multi-media era we are going to need some very large players," he says. "However, it is not immediately apparent in Europe who would be able to balance News Corporation if it does take full ownership of BSkyB. "At the same time, it is vital to guard against just having a knee-jerk, ideological objection to Mr Murdoch. His companies produce an exceptionally large amount of very high quality content, which is why they are so successful." Professor Luckhurst adds that is is "preposterously naive" to perceive what News Corporation does solely in regard to the support the Sun gave the Conservatives in the last election. However, it is this very issue that could make things difficult for Vince Cable if he ends up being the one to make the final decision on the takeover. His party - the Liberal Democrats - has been hostile to Mr Murdoch's media empire, while its Conservative partners in the coalition government have benefited from News Corporation's support. Mr Cable may be hoping any decision remains with Brussels, but the clamour for him to call it in - especially from other media organisations - may well be intense.